7/8/2013: My understanding is the UO Trustees are to be appointed and in place by this September. They will presumably then have semi-secret meetings for a year, until they take power in July 2014. Former Interim Provost Jim Bean is working on the by-laws now. I’m sure the lobbying is in full swing and the UO faculty and students will have no substantive input, just as with the Lariviere firing. Phil Knight did not go through all this trouble just to give UO a few billion dollars so that we could carry on our current path but with a little more style. Everything the man gets involved in is unconventional. Expect some big shakeups and innovations, soon and with no faculty input, except to the extent the union can fight a rear-guard action. I’m pleased to report to you that the Oregon Legislature has approved legislation that, when signed by the governor, will transform the way our university is governed by enabling Oregon’s public universities to establish institutional governing boards. I’m grateful to the members of the legislature; our campus community; our advocates, alumni, and friends; and the many others whose thoughtful and diligent work over the past several years led to the passage today of legislation that will benefit not only the University of Oregon, but higher education overall for the people of our state. This is a time of great opportunity, as well as great responsibility, for the University of Oregon. I have every confidence that in the years ahead, Oregonians will experience the benefits and enjoy the results of the combined leadership of an institutional board dedicated to the interests of this university, and an outstanding faculty and staff committed to education and research at the highest levels. Together, we will work every day to earn and keep the trust that has been placed in us by the people and communities we serve. SB 270 is crucial because the climate of higher education in Oregon is so unstable and unpredictable, and we need that local autonomy and flexibility to continue to advance excellence in higher education in Oregon. More than any other reason, SB 270 passed because of the unity and determination of our community, which we owe to one of our greatest champions, former President Richard Lariviere. In theory you can listen to the debate here: https://olis.leg.state.or.us/liz/2013R1/2013-07-06 but in practice the legislature uses an ancient ram format that I haven’t seen since before Napster. 7/3/2013: Eder Campuzano has the story in the ODE, vote is 23 to 7. For UO and PSU, board appointments would occur this summer, subject to confirmation by the state Senate in September. Cannon said he expects the governor to consult with university presidents, foundations, faculty, students groups and others before making recommendations on those appointments. I’m sure potential board members have been lobbying Cannon for at least a year. I’m on the UO Senate, we haven’t heard a word about potential members, and I assume we’ll have no effective input, as usual. Looking at the UO Foundation, the most likely outcome is board dominated by sports boosters like current chair Steve Holwerda. But maybe Kitzhaber will make a few decent appointments, and this won’t be entirely about sports. I still haven’t had a response from Gottfredson’s Chief of Staff Greg Rikhoff on whether the board’s initial meetings will be open to the public. A loophole in Oregon’s public meetings law would potentially let them meet in secret, until they actually get rule-making authority in July 2014. 6/26/2013: Starts at 3pm, scant details here, agenda here (3rd and 4th items). EOU, SOU, and OIT want more flesh. 6/16/2013: And are holding up SB 270 until they get it. The RG has the story from Jonathan Cooper of the AP. In totally unrelated news, the AP reports that bite marks are too unreliable to be used in court. And by popular demand here’s the budget for LCB: Instructional salary expenditures up 44% since 2008, administrative costs up 194%. And that’s before the $320K + OPE beamer is back on the payroll, and all the new hiring that Dean Kees gets into below. Oh wait, Bean will probably get most of his money from the instructional account. Hilarious. 6/15/2013. I’m speechless. I like the banjo though, even if it’s missing a string ;). 2. Jim Bean returns to LCB. As you know, Jim Bean will return to LCB on July 1 as the Harry B. Miller Professor of Business. For this summer and the 2013-2014 academic year Jim will still have significant central administrative responsibilities related to (a) preparing bylaws and staffing proposals for an independent UO board, (b) developing a systematic plan to enhance the presence at the UO of faculty in scientific and technical fields, especially those with research and teaching interests in transformational areas, (c) shaping UO capital campaign objectives, and (d) continuing the planning for the White Stag facility and development of campus interests in Portland. Jim will also hold the title of Associate Dean for Interdisciplinary Programs in LCB. In this (part-time) role he will lead the development of a proposal for a Portland-based UO interdisciplinary graduate (Masters) degree program in Sports Product Management. The proposal calls for this cutting edge program to be offered by LCB, in conjunction with faculty from A&AA, SoJC and the Law School. In the development of this proposal, Jim will be working with Ellen Devlin (consultant), Roger Best (Emeritus faculty) and the Warsaw Center faculty and staff on the design of the program, with UO Portland staff on issues of space and administrative support, and with myself, the Deans of A&AA and Journalism, and the UO’s Senior Vice Provost on issues of implementation, staffing and funding. Subject: Thank You for Another Great Year! With the academic year coming to a close, I would like to take this opportunity to thank you for an outstanding year of accomplishments and wish you a productive and restful summer. I hope to see you at one or more of our graduation ceremonies later today or on Monday. In the meantime, I ask you to carefully read the balance of this message for a few important announcements. Please do not hesitate to call or visit if you have any questions. 1. We have two “seniors” in the Dean’s office. Sergio Koreisha and Dave Boush will have the new title of Senior Associate Dean effective July 1. This change was made in view of recent and pending internal organizational changes (John Hull’s promotion to Assistant Dean for Center Operations, Jim Bean’s appointment as a part-time Associate Dean – see below) and to more closely resemble the most prevalent academic structures in peer business schools. 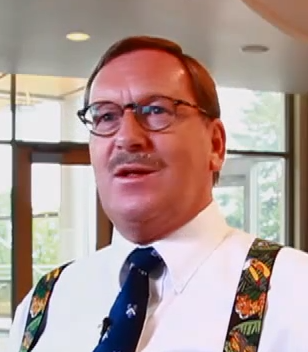 · Ross J. Kari recently retired from the position of chief financial officer of Freddie Mac. He held this position since September 2009 and was responsible for the company’s financial controls, accounting, investor relations, financial planning and reporting, tax, capital oversight, and compliance with the requirements of Sarbanes-Oxley. Additionally, he oversaw the Investment and Capital Markets division and management of Freddie Mac’s mortgage investment activities. Ross is a veteran finance executive with broad experience in the mortgage business and financial services industry. 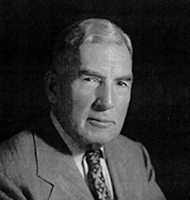 Previously, he served as chief financial officer of Fifth Third Bancorp in Cincinnati, Ohio. Before joining Fifth Third, Ross served as executive vice president and CFO of Safeco Corporation in Seattle where he managed a team of 250 financial professionals and helped grow business line revenue while enhancing essential risk management processes. From 2002 to 2006, he served as executive vice president and chief operating officer for another housing government-sponsored enterprise, the Federal Home Loan Bank of San Francisco. Ross spent a large portion of his career at Wells Fargo from 1983 to 2001, during which time he rose from senior financial analyst to executive vice president and chief financial officer. He received a Bachelor of Science degree in Mathematics and earned his MBA in Finance, graduating first in his class, both from the University of Oregon. · Merritt Richardson leads NIKE Golf’s efforts to create premium apparel and footwear for modern, athletic golfers around the world. She is responsible for providing strategic guidance and aligning the creative ideas and energy of a team of product managers, designers and merchandisers against the needs of athletes to drive profitable growth for the business. Prior to this role, Merritt’s experiences have ranged from administering the annual budget process for the entire company to directing the teams that create footwear for women runners; from a special assignment with the CEO to a stint in NIKE’s renowned Innovation Kitchen to overseeing the Brand’s efforts related to the 2012 London Olympics. A native Oregonian, Merritt received a B.S. in Business Administration from Oregon State University, but her sport allegiances lie firmly behind the University of Oregon Ducks. She is currently serving as a board member for the UO Student-Athlete Mentoring Program and is a past board member of the Oregon Club of Portland, which raises awareness and funding for UO Athletics. She and her family are long-time devoted Duck football supporters, travelling to all games, home and away. 4. Branding for a capital campaign. Many of you heard the brand story presentation by Chris Van Dyke at our most recent faculty meeting. Chris and the other members of the Songlines team interviewed many of you and generated distinctive themes that can be developed into a compelling message for the college. We plan to carry this effort forward so that, with all deliberate speed, we can identify a single differentiating slogan. To this end I have appointed a task force (Dave Boush, John Hull, Jim Engelhardt, Rebecca Monro, Katie Rohrer) whose charge will be to continue the discussion over the summer and into the fall. They will talk with many of you who were interviewed by Songlines and any of you who wish to weigh in for the first time. Perhaps most importantly, they will coordinate with Tim Clevenger, the newly-appointed Associate Vice President for Communications, Marketing and Brand Management to align our branding with the University’s efforts. Once we land on a single message, the task force will develop a full marketing communications campaign that we can present to potential donors to roll out in early 2014. 5. Building Issues. Work on the Chiles Exterior Renovation project will begin on Tuesday, June 18. For the first week scaffolding and temporary fencing will be installed and other prep work will take place. The demo work of the bricks is set to begin around June 27. The Chiles Complex will be closed off during the project with the exception of the IS/IT Offices and Building Management on the 3rd floor of Chiles. The demolition will be noisy and staff most impacted will be temporarily moved. Classrooms in Peterson & Lillis that are most impacted have been closed for the summer. The work will continue through the first part of September. As the project progresses, we will provide updates related to timelines. o 293 Anstett will serve as the Technology Lab space for Summer 2013, with 30 computers and one printer available for student use. o 262 Lillis will be the Technology Classroom (takes the place of 225 Chiles),with 30 computers available for student use. o The bike lockers between Chiles & Lillis will not be accessible. If you have one, the Parking & Transportation area either already has or will contact you with a new space for summer. If you have any questions about any of these building issues, please contact Frank Sharpy at extension 6-4794, Shandon Bates at extension 6-3814, or me. We look forward finishing the update of Chiles. Your patience is appreciated. Moffitt reveals UO Board will cost more than union dues. JH tries divide and conquer with faculty. The UO would need $1.7 million a year to hire 11 new employees to support its board and also perform financial functions the new entity would require, according to a UO analysis. I’m ccing Jamie Moffitt because she should be able to easily send them along. I ask for a public interest fee waiver because, well, because $1.7M is a lot of money. The union expects to be able to keep dues to 1.25% of salary or less. After the raises, that will work out to about $1.3 million a year. 6/7/2013: And speaking of divide and conquer, “The University” sends these emails out to all the faculty who are not in the bargaining unit. I tried to get on the listserv – nope. 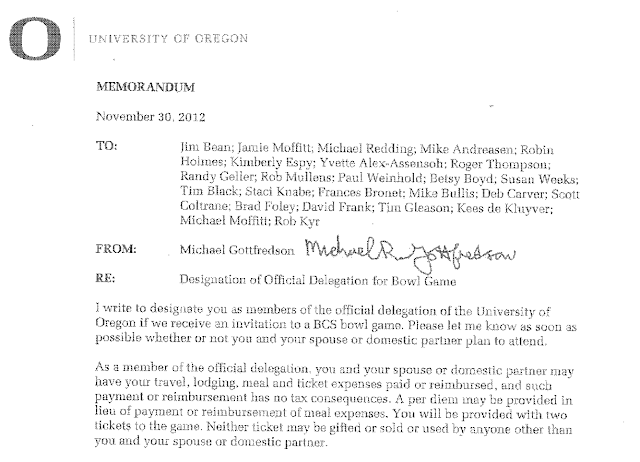 President Gottfredson won’t tell me who really writes them, unless I pay $285.98. But judging from the number of people who forward them on to me with sarcastic comments – most which violate my one cuss word policy – this strategy is backfiring almost as badly as the attempt to drive a wedge between the students and the faculty did. Free speech zones? Whoops. United Academics put a salary counterproposal on the bargaining table this week showing the faculty union hasn’t altered its position that the University of Oregon should spend more on salaries for bargaining unit members, regardless of other critical campus needs. The University has offered bargaining unit members across-the-board and merit pay raises averaging 10.3% percent for tenure-track and tenured faculty and 11.37% for NTTFs. 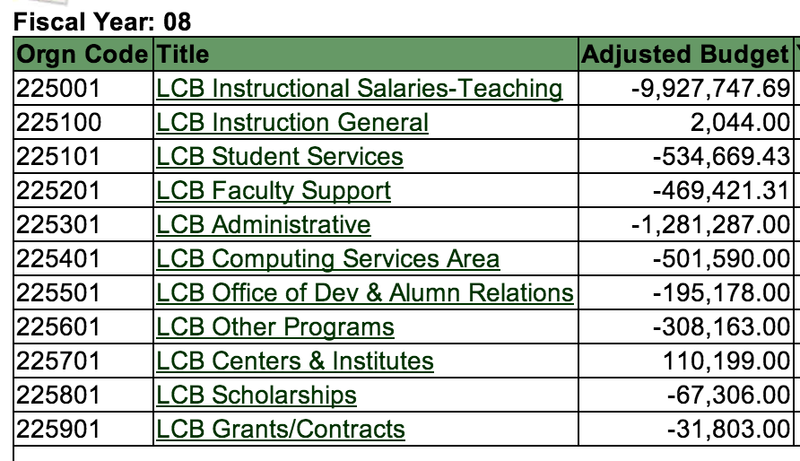 The NTTF figure includes $486,000 ($640,000 with benefits calculated) that would be set aside to address non-tenure-track faculty salary floors. In total, the University is willing to invest an additional $13.3 million a year for faculty compensation over FY 14 and FY 15. The union, however, wants more. The latest United Academics’ proposal calls for approximately a 15.2% increase in pay for tenure-track and tenured faculty and approximately 19.2% for NTTFs. That represents between $20.7 and $22.1 million by FY 15, or between $ 7.3 and $8.7 million more per year than the University’s compensation proposal. Both sides at the bargaining table readily acknowledge that the University has limited resources and many needs – including hiring new faculty, maintaining the UO library collection and services, upgrading the technology infrastructure, building and equipping classrooms, and adding advisors and counselors for students. There’s no disagreement that faculty excellence must be recognized and rewarded, and that improving faculty salaries is a major priority for the University’s limited funds. The University is committed to achieving the goal of bringing faculty salaries in line with our peer institutions and to accomplishing that goal in a manner that preserves and protects our financial integrity and viability. 1. Enhance the university’s attractiveness to current and future students, faculty and staff. 2. Encourage and reward the highest quality teaching, research and community service. 3. Maintain a solid and sustainable financial structure. 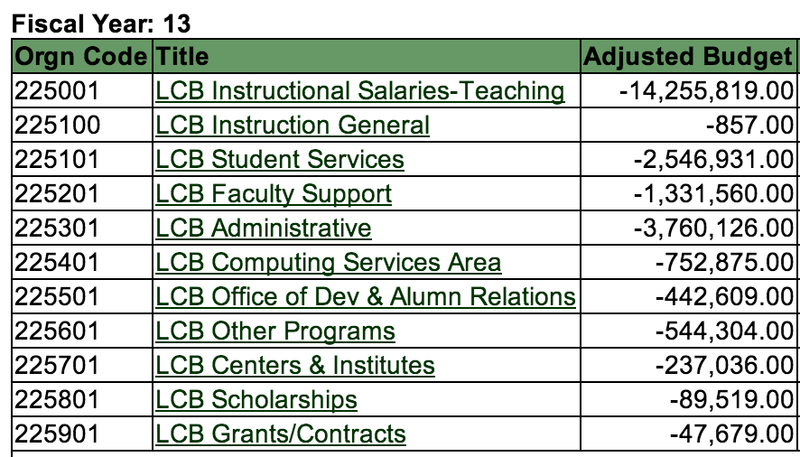 Faculty compensation is critically important, but we cannot meet all those goals if we ignore other critical needs. For additional information please visit the official website  of faculty contract negotiations (http://uo-ua.uoregon.edu/ ). Please feel free to share this link with others. 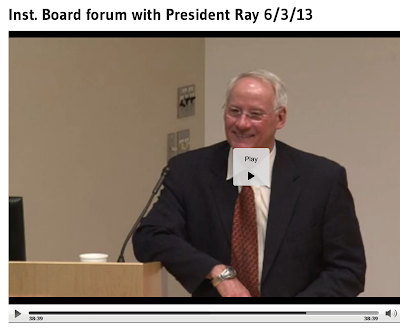 6/4/2013: That would be Ed Ray at OSU. Video below. UO President Gottfredson’s attempt to do the same is described here. Resources and news regarding the 2013 legislation to create a UO Board of Trustees. 5/29/2013: Kyr and others are testifying in the Ways and Means subcommittee today. Written testimony here. Supposedly there’s video here: http://www.leg.state.or.us/listn/listenset.htm under conference room F.
Meanwhile, still no response from President Gottfredson on the applicability of the Public Records and Meetings law to the UO Board. Word from the front is that the W&M meeting was jammed and none of the UO faculty got to speak. They will have another public meeting Wed.
Testimony for the Thursday 5/23/13 Ways and Means meeting on SB270 and HB3120 here. Many strong statements for and against. Open letters from Frank Stahl, the Deans, and the union on SB270 are posted at the bottom. To date, faculty who have expressed concern over the future of shared governance at UO have been publicly dismissed by President Gottfredson, and rebuffed at the union negotiating table. For example, when approximately 100 faculty and staff gathered this past Tuesday, May 14 for an opportunity to hear from President Gottfredson on the status of institutional board legislation, he shocked and dismayed many faculty with his lack of respect for preserving shared governance in relation to independent boards and our faculty union contract. At the negotiating table, President Gottfredson’s chief spokesperson has admitted that the UO constitution itself is not enforceable, and could be overturned by a new independent governing board. Article 12, Section 2. Notwithstanding the exclusive right of the association to negotiate and reach agreement on terms and conditions of employment, recognized in Article 1 (RECOGNITION), and the right of the University to carry out its ordinary and customary functions of management, recognized in Article 5 (RESERVED RIGHTS OF THE UNIVERSITY), the parties agree that it is mutually desirable that the collegial system of shared governance be maintained and strengthened so that faculty will have a mechanism and procedures, independent of collective bargaining, for appropriate participation in the governance of the University. To that effect, the Portland State University Faculty Constitution shall remain in existence for the duration of this Agreement subject to the provisions of Oregon University System IMD 1.120 through 1.126. Take-away: The big take-away, from the perspective of our team, is that the administration would like to move much of our current contract language around issues of faculty governance from the contract into the Faculty Senate’s realm (an important advisory board to the Administration). We fear that ultimately, the Administration wants governance to be “shared” disproportionately, leaving faculty fewer rights and privileges. The removal of these powers from the contract would mean significant changes in long standing evaluation procedures and would erode or remove current safeguards around process (removal from the contract means procedural violations could no longer be grieved). SB270: Creates independent boards for UO and PSU, allows OSU and others to follow if they can show support among their university communities. There is no requirement for such support from the UO community. President Gottfredson’s info page on governance changes. President Gottfredson’s efforts to charge the Register Guard $1065 to see emails from himself and Betsy Boyd on the SB270 negotiations. What do we have currently? That is what we stand to lose with a UO board, unless a policy specifically protecting existing Constitutions is incorporated in the legislation that creates such boards, or into the faculty union CBA. (b) Seven representatives who, in the discretion of the Governor, have experience in areas related to the university missions or that are important to the success of Oregon Health and Science University, including but not limited to higher education, health care, scientific research, engineering and technology and economic and business development. The proposed UO legislation? The governor can appoint anyone he/she wants to the UO Board of Trustees. No higher ed experience required. Pat Kilkenny, anyone? Faculty/student/ staff representation? The original bill included 2 voting faculty members and a student. One recent revision had a non-voting student but specifically banned faculty or other employees. The current draft includes the UO president, a student, and a faculty member as non-voting members. Student and faculty selected by the governor. 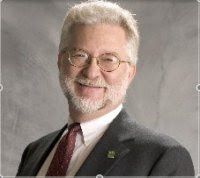 On May 20, 2013, President Gottfredson asserted, “The University of Oregon Constitution became the operative document for our shared governance system when [it was] ratified by the statutory faculty and signed by my predecessor on December 15, 2011. It is in effect as ratified and will remain so under an institutional board unless it is modified by procedures delineated in the constitution itself.” (http://president.uoregon.edu/content/president-gottfredson’s-comments-shared-governance). That statement may sound comforting, but it ignores the fact that university governing boards have no obligation to accept presidential advice whereas they are bound by actions of the State Legislature. Hence the way to guarantee the survival of our Constitution, which is in full compliance with State Law as well as IMDs and Policies of the State Board, is to amend SB270 to include Oregon State Board of Higher Education Policies p 104(7) and p105(8). This is the time for President Gottfredson to exercise much needed leadership by inviting the UO Senate to join him in a statement to the State Senate of support for such an amendment. We believe that a fully informed and constructive dialogue will best serve the future of our institution. We want you to know that we collectively see great potential in the UO’s advance toward institutional governance and toward a fair collective bargaining agreement, and have high hopes for the future under the leadership of President Michael Gottfredson. The legislative process that will determine the future of our governance is at a delicate and critical stage. Establishing a public governing board solely dedicated to the UO, with the ability to generate much-needed investments from outside sources is critical to the future success of the university. As Deans, we strongly support the tradition of shared governance at the University of Oregon and acknowledge its vital role in promoting academic excellence. As we move forward we do not think it should be narrowly redefined solely within the context of a collective bargaining agreement. As other institutions of higher learning with faculty and staff unions demonstrate, the commitment of Deans and faculty to shared governance cannot and should not be limited to labor contracts between a union and the university. [Not be limited…. what are they trying to say here? Spit it out: you don’t want the constitution to have legal protections in the contract, so that the faculty can’t effectively enforce shared governance.] We know all faculty at the UO (both represented and non-represented) share a commitment to academic excellence. Our mission requires that we continue to work together collaboratively to promote the highest possible quality of teaching, learning and research at the University of Oregon. The bottom line: We urge the UO community to come together so that we can build one of the strongest and most creative research universities in the nation. We trust [Thanks. Bit late for trust us stuff] that you will join President Gottfredson and us in promoting this noble and exciting endeavor by working together as we move forward. We value your commitment to excellence and believe that the future of the university is dependent on the strength of the entire UO community. Shared governance remains front and center this week. On Thursday, the Oregon House Ways and Means Committee will hold a public hearing on Independent Institutional Board legislation. On Tuesday and Thursday, our faculty negotiating team will be back at the bargaining table with the Administration’s representatives. 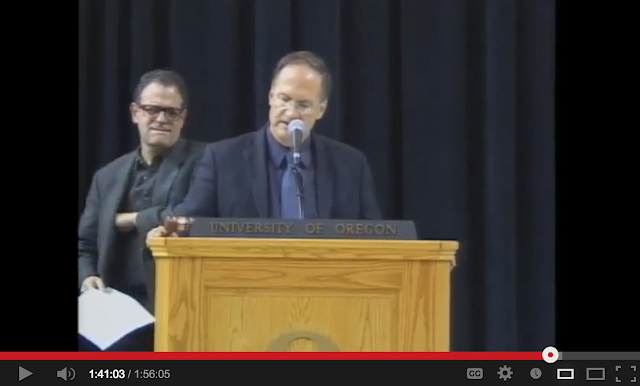 In both arenas, United Academics will continue to press the case to protect and preserve shared governance at UO. Bargaining will take place Tuesday and Thursday, 8am-12pm in 122 Knight Library. Negotiations are open to everyone. Please make time to attend negotiations and support your faculty negotiators! Senate Bill 270 and House Bill 3120 – the twin pieces of legislation that outline future possibilities for independent institutional boards at UO, OSU, and PSU – are up for a public hearing in the Oregon House Ways and Means Committee’s Subcommittee on Education this Thursday (5/23) at 8:30am in the Capitol, Room HR F. United Academics strongly believes faculty, staff and students should have representation and voting rights on any future independent board. As currently worded, pending legislation does not guarantee representation nor voting rights for faculty, staff, nor students. If you’re able to attend, click here to let us know and learn more about carpool opportunities. If you’re not able to attend in person, you can make sure that President Gottfredson, Governor Kitzhaber, and our elected representatives know that faculty at UO care about shared governance: CLICK HERE to send your message in support of shared governance now! HB3120: Expands authority and membership of Higher Education Coordinating Commission (HECC). Transfers State Board of Education (SBE) authority for community colleges to HECC. Abolishes Oregon Student Access Commission and transfers policy-making authority to HECC and administrative authority to newly created Office of Student Access and Completion. Brent Walth’s lengthy interview piece with President Lariviere on the genesis of the “New Partnership”, from the Oregon Quarterly in 2010. 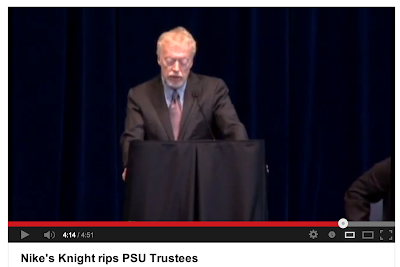 Phil Knight and Pat Kilkenny’s “Oregonians for Higher Ed Excellence PAC“. Still sitting on $450K, to get SB270 through the legislature. Docs on faculty opposition to a board w/o faculty representation, from the IFS and PSU. Irene Gerlingher, first woman to serve as a UO Regent, on the strange things that political boards do. UO Senate resolution in support of the New Partnership from 2010. Never voted on, from what I can tell. The UO Statutory Faculty meets in Mac court in November 2011, and unanimously approves establishment of a committee to work with the administration on independent board legislation. From what I can tell this committee was never appointed. Senate: Wed May 22, 3 to 5:30. Updated with proposed motion of no confidence. Update: A hearty congratulations to the losers of the Senate and committee elections. Names of the unfortunate winners are posted here. Agenda: Here and below. Legal services, new course approvals, perhaps a motion calling for amendments to SB270 to incorporate the constitution. Regarding the UO Board legislation, SB 270. FAQ here. Live blog disclaimer: My interpretation of what people said, meant to say, or what I wished they’d said. Nothing is a quote unless in quotes. Meet w/ Rob tonight, 6:00-9:00pm at Collier House to give him input for his testimony tomorrow the the State Legislature on SB270. Kyr: We’ve been dealt a bad hand over the past few years, as a university we’ve done as well as possible with it. Standing ovation, very nice remarks. Unable to make the meeting, he’s enjoying his retirement traveling. Very personable written remarks – handy with plumbing and can run a sewing-machine! Slips in a pitch for SEIU and for higher compensation for staff. Slick. Kyr: Paul’s put UOCC minutes and process onto the web, improving transparency and efficiency. Engelking: Remembers Wayne Westling with admiration. Great story about how he (Paul) was tricked into becoming Senate president. Paul Simonds, Senate Parliamentarian: As oldest “dead president” he inducts Kyr into the society, with two bottles of wine, one for each year. Might be worth showing up at Collier House tonight. Pres Gottfredson has agreed and is signing. Free at last. Gottfredson wants to divide these into 2 policies, so we’ll put these off until next year. Strange – the union contract has a lot to say about these issues as well. Paris: Harbaugh noticed that the UO is now independent of the DOJ, Stahl suggested removing that part. She now proposes delaying until fall so she can consult with UO’s General Counsel. Committee’s report was due June 15, but it will take much longer. Blonigen: We have a big charge, putting the committee together took a long time, lots to deal with here. Hopes to meet with stakeholders and with the many complainants about RIGE’s operations and Espy over the rest of the term, then work over the summer to benchmark RIGE with other universities, hope to have report in the fall. Kyr: Moderate revisions to campus planning and the committee on committees. Harbaugh and Mitchell propose amendment to include all facilities controlled by UO. Keyes brings up land use issues. Paris proposes postponing til we can figure it out. Approved. Committee on committees: This committee is supposed to appoint the faculty members of the administration’s advisory groups, when appropriate. Gottfredson has not been doing this. Motion strengthens the Senate’s hand a little. Paris: During the review of committees we discovered that there are a lot of administrative advisory groups that are “owned” by specific administrators. Sullivan: Amendment to allow looking into all such working groups. Approved unanimously. The Senate is now an hour ahead of schedule! Stahl: Announces that Nathan Tublitz wants to submit a notice of motion for a vote of no confidence in President Gottfredson. Last week I put forward to the Senate a motion of no confidence in President Gottfredson. The following day, after a meeting with the Senate Executive Committee and some FAC members, I agreed to hold off submitting my notice of motion only if the President endorsed the University Constitution and put forward his best effort to ensure that SB270 contained a clause guaranteeing our right to develop and maintain our own internal governance system free from interference by outside groups, including any future UO Board. The statement released yesterday by the President on his website (http://president.uoregon.edu/content/president-gottfredson%E2%80%99s-comments-shared-governance ) contained no such statement. Neither did the “press release” issued today on his behalf by Administrative Spokesperson Barbara Altmann. Nor has such a statement been issued at the current union negotiations by the Administration’s bargaining team which speaks for the President. It is clear that the President has no intention to ensure the continued existence of our ability to generate our own internal governance system, a right enshrined in the 1876 University Charter and which has been the foundation of our governance system for the past 137 years. The President’s unwillingness to go to bat to secure our governance system is the latest of many his actions since he took office that, taken together, demonstrate a disturbing lack of leadership and understanding of the University’s history and traditions. Therefore, with this email I formally give notice to the Senate Leadership of a motion of no confidence in President Gottfredson. There is no Constitutional reason not to accept my notice of motion. Thus, please add my notice to the Senate agenda for tomorrow’s meeting and announce the notice of motion at the Senate meeting. Please confirm in writing that you will add the motion to the Senate docket and that the motion will be announced at tomorrow’s meeting. Kyr: This is now an executive session, under the Oregon public meetings law, because this is a personell matter. No blogging about the exec session, because I am registered with the Oregon Secretary of State as an “Institutionalized News Media Organization” and the public meetings law forbids me from reporting on this. I’ll be back when the executive session part is over. 5:32: Executive session is over. Can’t say what was discussed, but the Senate will not be voting on this proposed motion at this meeting, which is the last until Fall. Kyr: I am very happy that Margie Paris is now taking over as Senate President. Long standing ovation for Kyr. My opinion is that Kyr has done a stellar job as Senate President and has fully earned the respect of the faculty which he now holds, for his untiring, selfless, and productive service during two incredibly difficult years. He’s negotiated many minefields and has come out of them with the respect of those who’ve worked with him, and at times against him. I say that despite having had him shoot me down on a few issues. We’ve been lucky to have him, and it’s great news for UO that he will continue to serve on the Senate. I don’t understand the email below from your Public Records Officer, regarding emails about the drafting of legislation for an independent UO board. She says her original estimate was unclear. No, it was perfectly clear, to the penny: $1065.29 to see a few emails. What is unclear is why the sudden 40% discount she’s now offering. I’ve asked before for an explanation of the PR Office’s policies on fees. You wouldn’t give me anything substantive. Why not? Please forward an explanation for this unexpected 40% sale price. If I don’t buy at $639.18, is there a chance you’ll come down more? Does the answer depend on how much I can embarrass you, Randy Geller, and President Gottfredson over using these charges to delay or prevent the release of public records to the public? Can I also expect a discount on the $285 you are trying to charge me for a single email showing the names of the members of the administrative union bargaining team? Are you also willing to haggle over the $535 you are trying to charge for a single month of invoices showing how much public money UO is paying HLGR to negotiate, slowly, with the faculty union? What will it take to make you see the light on this issue, and realize that your office’s continued and persistent efforts to frustrate the release of public records are, in the end, far more damaging to UO than anything that is likely to be found in these documents? The estimate I sent you on 5/16 in response to your request for an update on your request for “all records generated or received by University of Oregon employee Betsy Boyd and UO President Gottfredson regarding proposed or draft legislation that would create a University of Oregon governing board or otherwise change the relationship between the UO and state government. The time period for the request is Nov. 1, 2012 to the present”, was unclear. I would like to clarify that while the actual cost of responding to your request is $1065.29, the office has agreed to provide a fee reduction of 40%. Accordingly, the new estimate for your request is $639.18. Upon receipt of a check made payable to the University of Oregon in this amount, the office will proceed to locate, copy and provide the records you have requested that are not exempt from disclosure…. The Ways and Means subcommittee meeting is scheduled for 8:30 AM, Salem, Thursday the 23rd. One last chance to let your legislators know how you feel about this power grab. Whoops, the video of President Kyr and Peter Keyes, and the resolution below, are from November 2011, at the meeting of the Statutory Faculty in Mac Court, protesting the Lariviere firing. I believed I was endorsing legislation for a board that would including voting faculty and that would put the UO constitution on a firm legal footing. Now the legislation has been written by President Gottfredson, Randy Geller, and their unknown advisers and lobbyists. There’s been little to no faculty input. Unless you count Gottfredson’s “asked and answered” fiasco on Tuesday. The Oregon legislature will probably vote on this within weeks. Does the faculty support it in its current form, which includes no voting faculty members, and no guarantees for shared governance? Who knows – we’ve never been asked. The UO Faculty Assembly directs the Senate Executive Committee, or an ad hoc Senate Committee to be appointed by the Senate President, to initiate negotiations with State Legislative leaders and the Oregon State Board of Higher Education, leading to the appointment of a University of Oregon Board of Trustees. 10. Authority over the hiring and firing of president of UO.